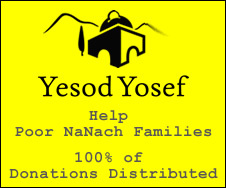 Na Nach Nachma Nachman Meuman: Why 600 000 need to say Na Nach??? Why 600 000 need to say Na Nach??? Moses asked one by one all 600 000 baale bait to assist him in finding the bones of Josef. The excuse not to help him was, ""we have a mitsvah to determine where the Egyptian Gold is hidden" . There were at least 1 800 000 people to bury also. Each tribe was taking out their own leader.. except Narchon who was having trouble taking our Jehuda who was turning in his grave due to a promise he made to Jakob. He would never leave Egypt without Benjamin. Without Josef no one would be able to cross the sea and he knew it. That makes it even more strange. When Moses finally did take Josef out he didn't let anyone touch him except Joshua who appointed 10 trusted men to carry Josef. Serach Bat Asher lived at least till 400 and buried the man that should have married her (for those that want to know, she was adopted from outside the tribe). 600 000 had refused to keep the formal promise made to G-d and Josef. This can only be a set up for the requirement of Rabbi Nachman: "why do you worry I go before you, just be together and I will be with you" Before you to the land of Israel. (Saba Israel) and I will be with you the bones. This is a bit like Josef....also all the shekels are the people of Ebay Ha Nachal and the wheat comes from Ukraine etc etc (josef is the wheat and the money of the world).